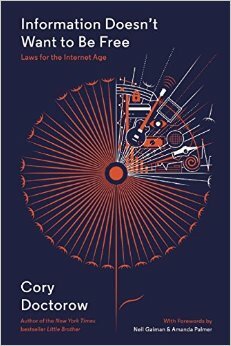 Information Doesn’t Want to Be Free by Cory Doctorow is, as one would expect, an incisive and lively exploration of the issues surrounding copyright and enforcement in the Internet Age. Dr. Doctorow is established as an outspoken critic of the various methods that media corporations use to try and enforce their interpretation of copyright laws on the Internet: digital locks, DRM efforts, automated “Notice and Takedown” practices, etc. He takes on each of these methods and explains clearly what they’re intended to accomplish, why they fail, and the damage they do to creative workers and Internet users in general. Some of these methods involve pretty esoteric computer science and Dr. Doctorow is the best in the business at translating the argot of technology into terms anyone can understand. Most importantly, he explains why arguments over copyright in the Internet Age are necessarily about more than just intellectual property rights. In less technological times, copyright laws really only affected commercial producers. But given how the Internet itself works—given the core structure of this information-sharing system—attempts to strictly enforce copyright online have a powerful impact on every Internet user in all of our online interactions, even when no copyright infringement occurs, even when interactions involve no copyrighted materials at all. On the Internet, you can’t separate the mechanisms that have been built to enforce copyright from unrelated online interactions. That type of differentiation is impossible. As a consequence, the tools that commercial media conglomerates use to try and protect their intellectual property online undermine the safety and security of the Internet itself. These tools open doors for malicious hackers and viruses. They enable governments and other entities to spy on Internet users regardless of whether or not a user is doing anything that infringes copyright. This is a facet of our current copyright arguments that too many people don’t understand. Dr. Doctorow puts it front-and-center and clearly identifies the potential for disaster. Copyright can’t be handled in the online world of the Internet Age according to the same rules that governed it in the analog world. Reality has changed and copyright needs to change accordingly, to work in ways that don’t make us all unsafe, in ways that don’t punish innocent people indiscriminately. The Internet is too important to allow media companies to control it, just to try and prevent a handful of people from stealing a movie or two. So far, attempts to reform copyright law to apply it to the Internet have only benefited the middle men who profit from the distribution of creative works. Copyright no longer serves the interests of either the creators or the audience. This struggle for reform isn’t without hope, as Dr. Doctorow points out. There are other models for handling copyright online that show promise. Historically, every time new technology came along to supplant the dominant paradigm, those who profited the most from the old ways have resisted and attempted to stifle innovation. This isn’t the first time those in power have tried to use copyright laws to prevent change. These attempts have never succeeded. Indiscriminate, draconian copyright enforcement—the primary weapon wielded by old guard media companies to resist technological change—probably won’t succeed this time around, either. The question is: how much damage will they do to the rest of us in the meantime?